The 1-4 offense tends to "flatten" the defense, and with the empty space under the basket, is ideal for back-cuts to the hoop, especially from the wing. In fact, when we are on defense and see this set, we expect underneath cuts. This offense also is effective against teams that over-play (deny) the pass to the wing (which makes them more vulnerable to the back-cut). Also see: West Coast 1-4 High Stack Offense. 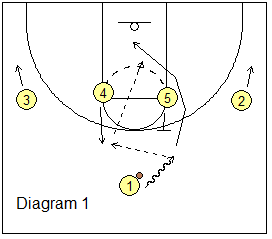 You can imagine some simple things, like O1 passing to a high post player, and then the wings O3 and O2 back-cutting to the hoop for the pass from the high post. Or the pass could go to a wing, and the near post screens away for the opposite post, who then cuts to the hoop for the pass from the wing. 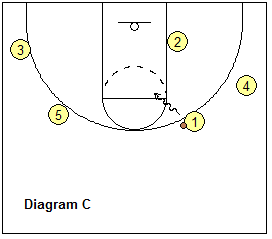 Several set plays are presented below. 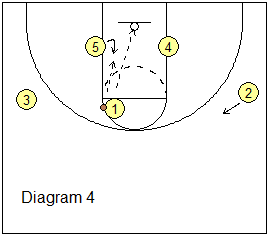 1-4 Stack, Post-Point Pick ‘n Roll, "41"
This play uses a simple high post screen for the point guard, and then the seal and roll by the screener (see Setting Screens). 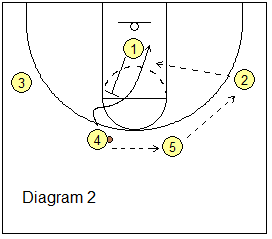 The same side wing (O2) slides deep into the corner to clear his/her defender out. This makes the wing O2 available for a "kick-out" pass to the corner for the outside shot (3-point shot). 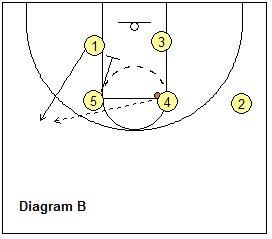 This is a simple high post pick and roll play where the pass goes to the player rolling off the screen. O1 is at the point, O2, O3,O4 and O5 stack across, at the free-throw line extended (diagram A). 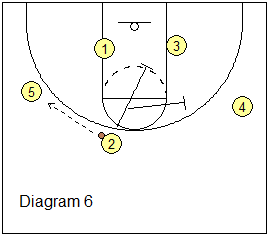 O1 calls the play and starts to dribble to the right to clear a passing lane. A jab step to the right or a pass fake to the right might work as well. Or O1 could pass to O2, and O2 to can make the pass inside. O4 sets a pick for O5 and seals the X5 defender (diagram B). O5 cuts around the pick. O4's defender (X4) will probably switch and go with O5 on the cut. O5 takes the X4 defender with him to the baseline (out of the way and out of the paint). 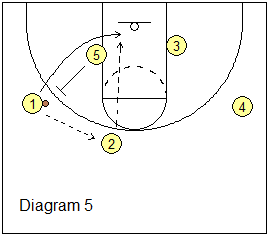 O4 now has inside position on the X5 defender and cuts to the hoop, for the lob pass from O1. 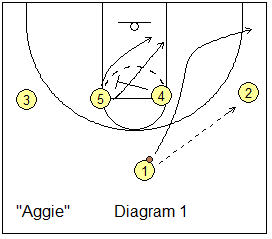 Coach Mark Few (Gonzaga) uses this action, which actually is a repeating pattern. Starting in the 1-4 set (diagram 1), O1 passes to O2. 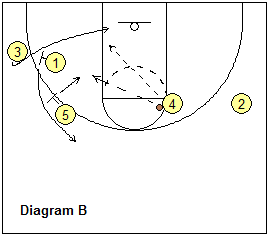 O5 sets a UCLA screen for O1 and O1 cuts to the hoop, and out to the opposite corner if the pass is not there. 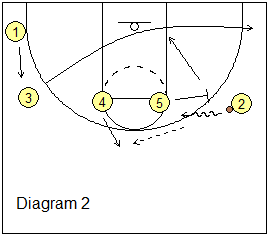 O5 then sprints over and ball-screens for O2 (diagram 2). O5 immediately rolls to the hoop. O2 dribbles over the screen and passes to O4, who has stepped out to the top. O3 cuts through to the opposite corner. O4 looks to pass hi-lo to O5. Diagram 3 shows the next pass goes to O1 on the left wing. 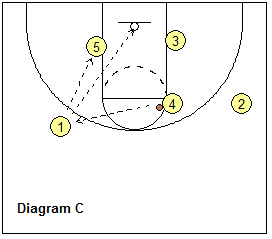 O5 sprints up to the top and O4 follows the pass and ball-screens for O1. O4 then cuts to the hoop. O1 dribbles over the screen and passes to O5 (diagram 4). O5 looks for O4 inside. This pattern can repeat from side to side until something is open. 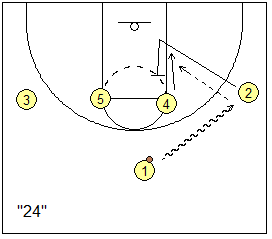 Run these plays off the 1-4 set. See the diagrams below. O2 and O3 cut low and cross to the opposite sides. O1 passes to either side (O2 in the diagram B), and the ball-side high post (O5) drops to the low post for the possible pass inside and post move. O2 could also shoot the 3-point shot. 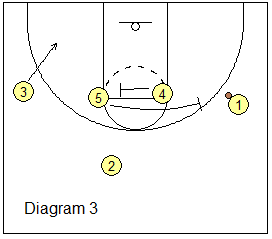 The opposite wing (O3) drops inside as a back-side rebounder. If O2 does not shoot or pass to the block, then O4 flashes to the ball-side high post, while O3 sprints up and back-screens for O1 (diagram C). O5 slides out to the short corner. 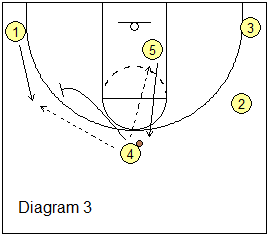 O1 cuts over O3's back-screen (diagram D) and could get the skip pass from O4 for the possble 3-point shot. O3 could also "slip", or seal and roll-off the screen, and cut up the lane for the pass from O4 (diagram E). 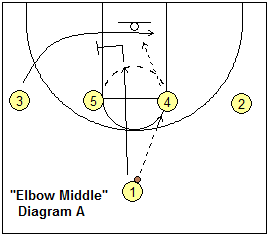 You can also run a "Back" option (diagram E) to keep the wing defenders "honest". O2 and O3 start their low cuts, but then suddenly cut back to their original spots, for a pass to either side. 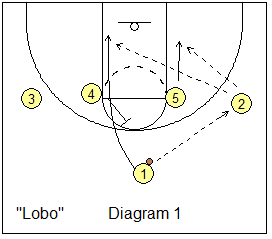 Then the rest of the play is run the same as above with the ball-side post dropping to the block, etc. Again, start with the 1-4 set. See the diagrams below. O4 drops to the block and first back-screens for O2, and then for O3. O2 cuts low to the opposite corner, while O3 cuts low and crosses to the opposite wing for the pass from O1. Next (diagram B), O4 cuts up to the elbow and receives the pass from O3. O3 then slides up toward the top and O1 also moves laterally. Meanwhile, O5 drops inside and screens for O2, and O2 makes a "flex" cut over O5's screen into the paint, for the possible pass and shot. If O2 does not get the pass, O2 moves out to the corner, and O5 then cuts into the paint for the possible pass from O4 (diagram D). Notice that while the flex cut is being made, O1 back-screens for O3 (diagram C), and a pass from O4 to O3 for an outside shot is also an option (diagram D). If you run "Hoyas" and find the flex-cut and the inside jammed with helpside defenders, run the "Hoyas-21" option instead (diagram E). 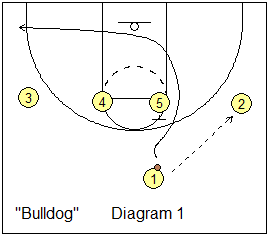 The play is run the same as "Hoyas" with O2 and O3 crossing and the pass going to O4 at the high post. This time, instead of running a flex-cut into the helpside defense, O2 moves outside and back-screens for O1 (diagram E). 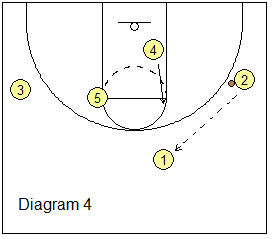 O4 could pass to O1 for a 3-point shot (diagram F). 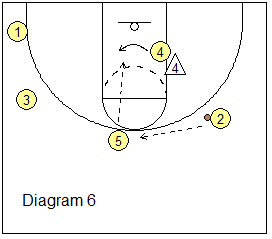 Notice that we also have O5 cutting through the paint (diagram D) for a possible pass from O4 and the lay-up. Here's another play off the 1-4 set (diagram 4A). This play gives our athletic O4 a chance to play. O1 passes to O4 at the left elbow. O2 slides down to the corner and O5 pops out to the weak-side wing (for spacing). 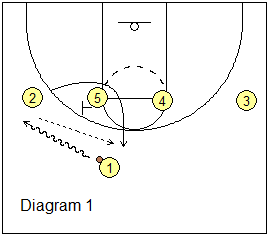 O1 cuts hard around O4 for a possible hand-off and dribble-drive (diagram 4B). O4 rolls to the hoop, like a pick and roll. O3 moves up top as our safety. 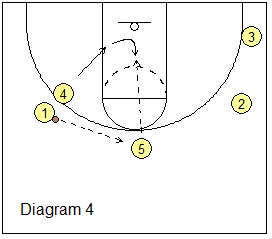 Often the defense will switch as O1 makes the cut around O4... O4 reads this and instead of making the hand-off, with a quick first step, dribble-drives around the defender for a lay-up (diagram 4C). Notice that we have O2 in the corner for a kick-out pass and 3-point shot. 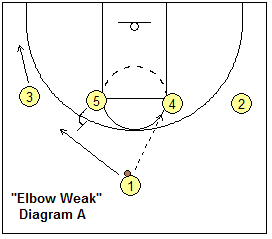 Geno Auriemma's 1-4 High Offense "Elbow Series"
Coach Auriemma (over 900 wins, multiple NCAA Women's Championships at UConn) has used this simple 1-4 high "elbow" series at UConn. See diagram A below. O1 passes to O4 and screens for O2. 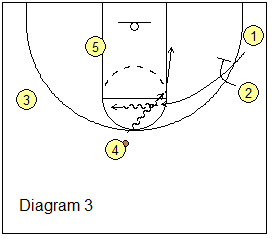 O2 cuts to the hoop, and could get the pass from O4, and a lay-up. 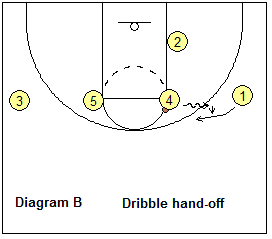 If not, O4 dribble hand-offs with O1 (diagram B). O1 now attacks, and O1, O4 and O2 play a 3-man game. There are kick-out options to O5 and O3, who locate out to the 3-point arc (diagram C). See diagram A below. 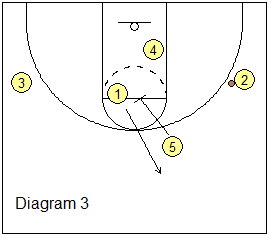 O1 passes to O4 and cuts through the middle, and then sets a flex-screen for O3. 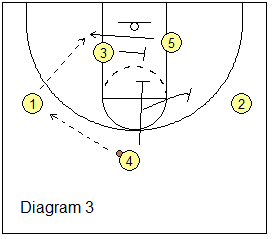 O3 makes the flex-cut and O4 could pass to O3 for the lay-up. Next, O5 down-screens for O1 (diagram B). O1 cuts to the arc for the pass from O4. O1 is often open for the shot here (diagram C), or could pass to O5 posting up, as we could have a size mis-match after the O5/O1 down-screen. See diagram A below. O1 again passes to O4. O3 drops down and O5 screens for O1 (O5 will set two screens for O1). O1 cuts over the screen and then O1 screens for O3 (diagram B). O3 cuts inside for a possible pass from O4. After screening for O3, O1 turns and cuts over O5's second screen. O4 passess to O1, and O1 could be open for a shot here (diagram C), or O1 could also look to O5 posting up inside. 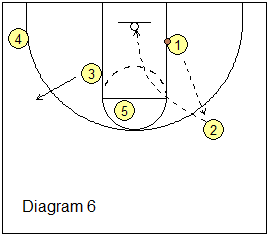 Another excellent option - if the defense switches the second O5/O1 screen, O5 slips the screen (diagram B), cuts to the hoop and gets the pass from O4 and the lay-up. Here's another play off the 1-4 set (diagram 1 below). O1 passes to O2. O5 slides down to the ballside post and could get the pass from O2. 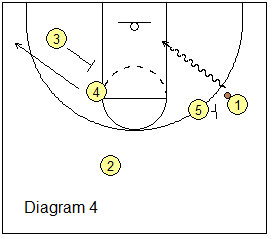 O4 back-screens for O1 and O1 cuts hard around O4 for a possible lob pass from O2. If neither are open, O2 passes to O4 who has stepped out on top after screening (diagram 2). O3 down-screens for O1. O4 passes to O1 (diagram 3), as O3 cross-screens for O5. O5 cuts under the screen and could get the pass from O1. Meanwhile, O4 could either down-screen for O3, or screen-away for O2. Diagram 4 shows O4 screens-away for O2, and O2 cuts to the top for the pass from O1 (diagram 5), and O4 fills the right wing after screening. 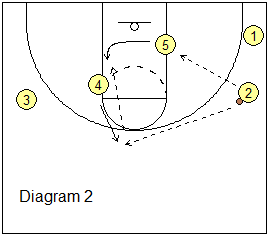 On the pass from O1 to O2, O5 back-screens for O1 and O2 looks to pass to O1 on the basket-cut. If this is not open, O2 passes to O5 and could either down-screen for O3 or screen-away for O4. On the down-screen, O3 cuts hard to the top for the pass from O5 and a possible open 3-point shot. Or we could continue to repeat the pattern seen in diagrams 5 and 6 (wing back-screen and back-cut) for a continuous pattern until someone is open. 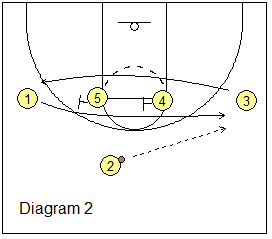 Here's a very simple 1-4 play that even youth teams could use. Often the simple plays work the best. The diagram shows O1 dribbling to the right wing. O2 cuts inside to block and then back-screens for O4. O4 cuts to the hoop for the pass from O1 and a lay-up. O2 pops out on top after screening. This play from coach Steve Forbes has great hi-lo options. You could run it either right or left. Starting with the 1-4 set (diagram 1), O1 passes to O2, and cuts to the ballside corner. Meanwhile, O4 cross-screens for O5, and O5 cuts hard either above or below the screen to the right block, and could get the pass from O2 (diagram 2). After screening, O4 pops out on top and gets the pass from O2. O4 makes a hard pass-fake to O3. O5 ducks under and seals the defender, looking for the hi-lo pass from O4. 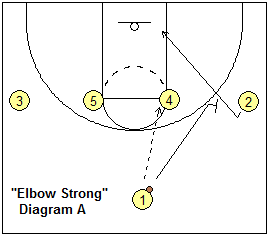 If not open, O4 dribbles to the right elbow (and not any higher than the elbow), as O2 down-screens for O1 (diagram 3). O1 cuts around O2's screen to the elbow and receives the hand-off from O4. After screening, O4 cuts hard to the right block. 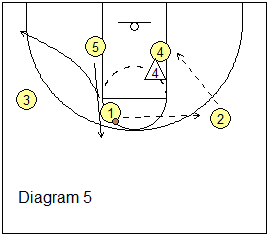 After the dribble hand-off, O1 could shoot (diagram 4), or pass hi-lo to O5 sealing inside. If O5 is not open (diagram 5), O1 passes to O2 (who has moved up to the wing). After passing to O2, O1 cuts to the left corner and O5 cuts to the top. O2 looks to pass inside to O4, who seals the defender. If the pass inside to O4 is not open, O2 passes to O5 (diagram 6). O4 seals the defender and now should be able to get the hi-lo pass from O5. Coach Lou Henson ran this play at Illinois. 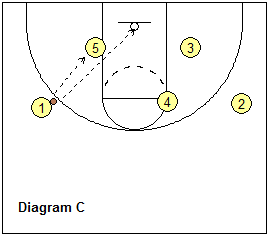 Starting in the 1-4 set (diagram 1), O1 dribbles right and passes to O4 who steps out beyond the arc. O5 back-screens for O1 and O1 cuts around the screen to the hoop, looking for the pass from O4. 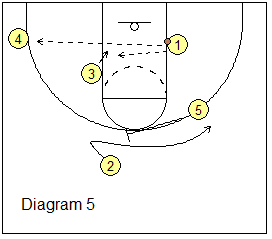 After screening, O5 steps out beyond the arc and gets the pass from O4 (diagram 2). O5 passes to O2, as O1 back-screens for O4. 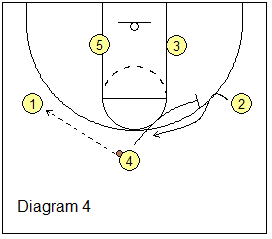 O4 makes the shuffle cut either over or under O1's screen and could get the pass from O2 and a lay-up. After O4 cuts, O5 screens the screener O1, and O1 cuts to the top. If O4 is not open, O2 passes back out to O1. O4 moves up to the elbow and we are back in the 1-4 set. You can run this pattern over and over until you get an open shot. The second time through, you might have the point guard O1 dribble left and run it on the opposite side. O4 and O2 are your good shooters. Starting in the 1-4 set (diagram 1 below), O1 dribbles left as O2 shallow cuts around O5 to the top, and gets the return pass from O1. Next (diagram 2), O5 and O4 screen for O1 who cuts over the screens to the right wing, while O3 cuts under to the left wing. O2 passes to O1. O4 cross screens for O5 (diagram 3), and O5 ball-screens for O1. O3 moves to the short corner area. Instead of using the ball-screen, O1 rejects the screen (diagram 4) and dribbles to the hoop, as O3 flare-screens for O4 and O4 cuts to the weakside corner. O1 either finishes the lay-up, or passes across to O4 for the corner 3-point shot. O3 might also be open on slipping the screen. 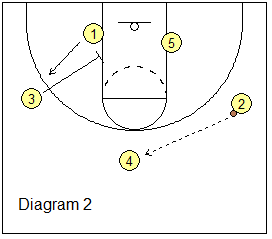 After O1 starts the dribble-drive, O5 flare-screens for O2. O2 cuts to the right wing and could get the pass back from O1 for an open 3-point shot (diagram 6). 1-4 Low Stack Plays, "Pinball", "Double-Cross", and "Spurs"
with Van Chancellor, Louisiana State University Head Women's Coach. with Sharon Versyp, Purdue University Head Women's Basketball Coach. with Marquis Hines, former Vincent (WI) High School Girls Head Coach.